This is a beautiful thick gloss copy of "Cao Yong's" famous painting "Freedom". 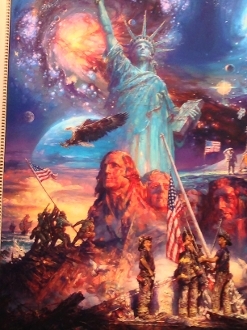 This is the same painting that was blown up 50 feet high for the back drop of the 911 commemoration seen all over the world. It depicts our countries accomplishments and tragedy's like no other picture! We have this framed and above our fireplace, and we never stop getting compliments.